Another week gone by - I think that marks the fifth back to school? Crazy how fast time flies by! 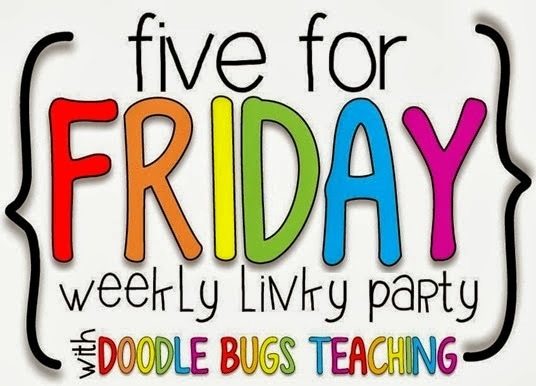 Here's my Five for Friday and a Link-Up with Doodle Bugs Teaching! This week, lots of memories come to mind from the classroom, but seeing our Bilingual Kinder class in action was so fun. I speak enough Spanish to follow along and the kiddos were doing a read-aloud with their teacher and working on making predictions. It was the fact that they were kinders, plus the fact that they were doing a lesson on predicting, plus the fact that they all spoke Spanish, plus all the little management techniques their teacher used. 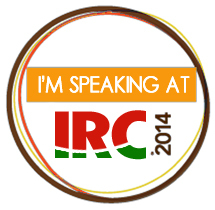 I was sitting there thinking, "I wish I had my iPad - I want this on video" - but I was too engaged to go get it. Such a fun time in kinder this week...Actually all our kinder classes were deep into their literacy centers, working on building independence for guided reading that will be starting very soon. All of this makes my heart so happy, and reminds me how hard kinder teachers work with their kids. So happy to see these little ones engaged and having fun with friends in class! So this lesson is great to get kids to think about whether or not their idea is big or narrow. 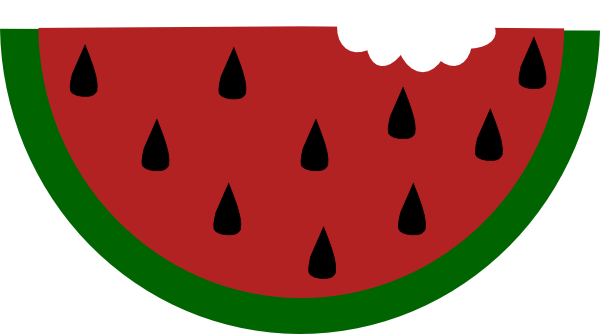 The watermelon story is the big juicy watermelon that is your life. Within your watermelon story, you have lots of seeds - seeds about family, friends, vacations, school, houses you've lived in, celebrations, cousins....every memory is a seed. 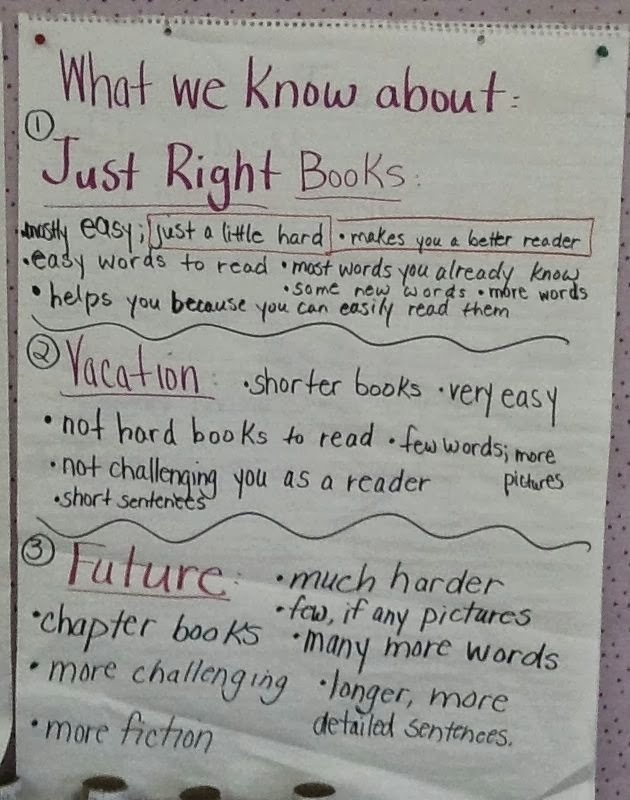 So the anchor chart is awesome because it's all of the kids' language about Just Right, Vacation, and Future books. Teacher facilitated the discussion and recorded their words and now the kids have a great reference to use in their classroom! Part of the reason I haven't been writing as much is because of Grad School. Yes, I'm back for a second Master's...this time for a Principal's Certificate. 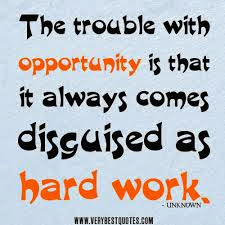 It's not hard, just a lot of work. But, it's really interesting. 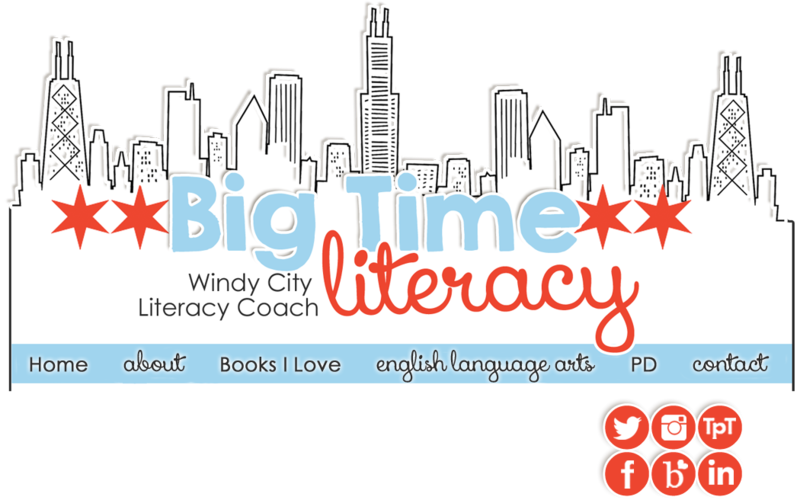 Now that I have this position as Literacy Coach, I'm not just me, in my own classroom...I get to work with all the teams around my school. So, I can see lots of theory in practice. Of course, I'd rather be spending my free time blogging, and watching Breaking Bad (new obsession now that I've finished Friday Night Lights) but I am reading about Organizational Structure and writing philosophy papers again. But, it's okay....like I said, super interesting and I love the people in my cohort at NEIU! 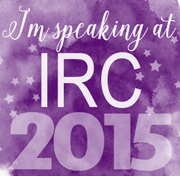 The best weeks are those that involve me hearing from former students, and I heard from six of them since last week! My girls, Ali, Lillian, and Michelle are all doing well in high school, Baltazar sent me a picture of his progress report that was straight A's, and then Kirstin and Andy visited last night after school. Andy was so sure he was going to get space from another kid in from our homeroom last year, but now he still has two classes with him....and they're at a *huge* high school. Hhahaaa! Kids are so funny. I'm so proud of all of them - doing so well in their new schools, and keeping me in the loop with what's going on! That's all from me here at BigTime Literacy. Hope you have a great weekend! What an awesome gift to hear back from past students! You certainly made a difference. So awesome! I saw that you are working on building your school's mentor text collection. One of the books that I read as part of my CAGS in literacy program was "I Can Write Like That. 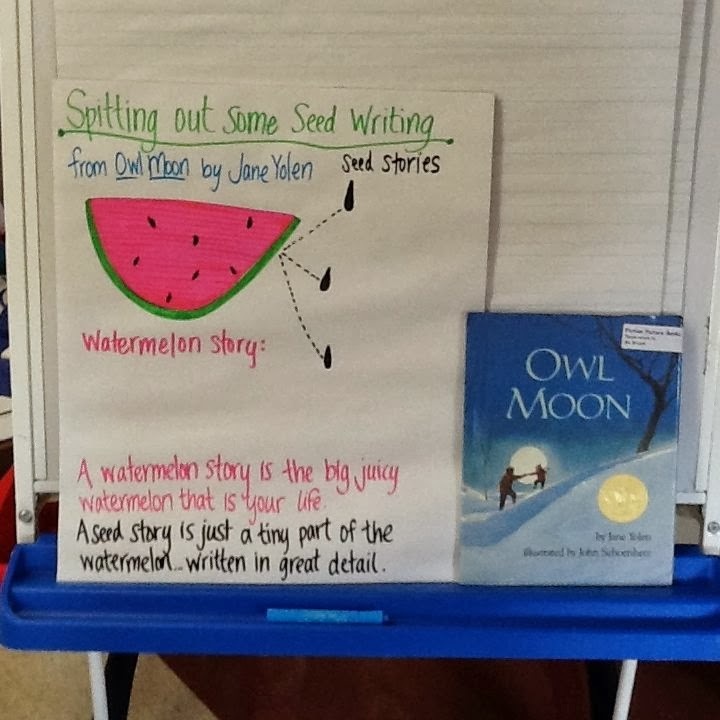 A Guide to Mentor Texts and Craft Studies for Writer's Workshop, K-6". Excellent resource for teachers. It includes lists of book organized by craft elements. I really enjoyed reading it. 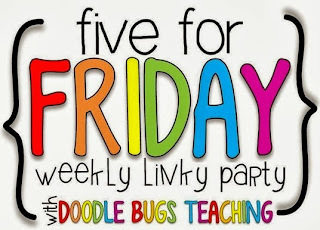 Glad I found your blog through Five for Friday. Thanks for the tip on the book to read! I'll definitely look it up :) I've been using Fletcher's Craft Lessons book- a great resource if you haven't seen it! He's got one for fiction *and* nonfiction writing!